Primal is the latest supernatural adventure game from Sony Computer Entertainment that features the sexiest siren since Lara Croft, Jen. The story opens up with a beautiful orchestrated opening sequence that takes place in a gothic nightclub where this huge demon creature is observing a live band. The creature is actually preying on the lead singer of the band, Jen's boyfriend Lewis. As Jen and her boyfriend leave the nightclub, they are attacked by this demon and Jen is left for dead. Eventually Jen wakes up in a hospital but not all is what it seems as she is experiencing an out of body experience. Jen fears that she is dying and panic starts to set but a strange an demonic gargoyle walks into the room and assures Jen that she is far from dead. The gargoyle introduces himself as Scree and beckons Jen to follow him into the netherworld where he can explain everything. Curious as a cat, Jen follows Scree into the primal etherland where she finds out that she is the chosen one and must battle an evil threat that not only could end the world but also the known universe. Primal is unlike any other game on the PlayStation and is a combination of a role-playing game, adventure and arcade game that actually works quite well. In its essence, Primal is a beautifully created third-person game that lets the gamer control either Jen or Scree. Depending on what level (or world), the characters are up to, it is vital that you swap between characters to help solve puzzles. For instance, Jen can squeeze between gaps that Scree cannot fit, whereas Scree has the uncanny ability to climb any walls that are made from stone. Primal isn't your average hack and slash game but far from it as it is more the thinking mans Drakan or Tomb Raider. 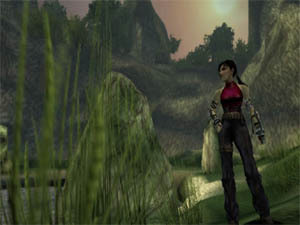 The combat in the game doesn't take centre stage at all, rather the game is about solving puzzles and figuring out how to successfully complete a world before you can continue. 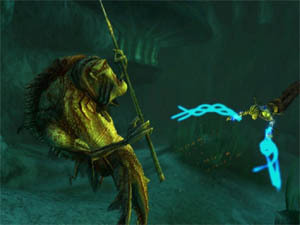 The gameplay of Primal involves controlling two different characters, that of Jen and Scree with each having different abilities. Scree is primarily the puzzle solver in the game, whereas Jen is the fighter and as you continue through the game, Jen will discover new abilities that lets her transform into various demonic creatures, each having specific powers and combat moves. The gaming environment in Primal is massive and there are literally dozens of worlds (or planes) that you can visit as Jen and Scree. Fortunately the developers have included a map and the ability to save the game anywhere you like. Travelling from world to world is done through portals that lets you switch between worlds. These gates are extremely reminiscent of Stargate and Primal manages to pull off its own special effect without borrowing too much from the movie. The control system of primal uses the analog stick to control your characters and the select button is used to swap between characters. Combat involves a variety of buttons such as hack and slash but the most annoying thing about the control system is the lack of a jump button... not that it is needed in the game but it is strangely absent. The ability to climb, jump or open doors is also done automatically in the game so it does take away some of the fun. Fortunately the camera angles are perfect in the game and you will not get stuck with a bad camera angle and the game also lets you rotate the angles whenever and wherever you like. On one level, Scree got stuck in a particular place and whenever I tried to switch to Scree, the game wouldn't let me, frustrating to say the least and I had to restart the level. Graphically, there has not been a better looking game on the PlayStation and the game features some of the most realistic textures and animation that I have ever seen on the system. The main character Jen is perfect in almost every way with extremely realistic texture details, movements and personality. All the characters in the game, besides the main two characters contain a very high polygon amount with brilliant textures to give some of the most realistic looking monsters anywhere. 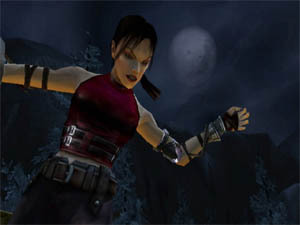 There are also a variety of lighting effects such as weather effects, fires and candle-lite to give Tom Clancy's Splinter Cell a run for its money. Best of all, the game runs at brilliant 60 frames per second with only minimal slow down that happens very rarely. The soundtrack of Primal is amazing and contains the band 16 volt that really helps put this game above others in the music department. Apart from the heavy metal that is featured in the game, the orchestral aspect of the game is actually performed by the City of Prague Philharmonic orchestra. The voice acting of the all the characters in the game, especially Jen has been professionally done and once again I will reiterate, the best voices that I have heard in any game. There is a variety of ambient sound effects that helps set the atmosphere of Primal of strange and unknown worlds and best of all, the game actually supports Dolby Digital 5.1! 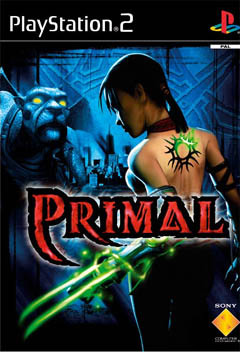 With amazing graphics, a beautifully written storyline, the best soundtrack to ever hit the PlayStation 2, Primal is pure brilliance! Highly Recommended!